XS-Shoulder:14.6inch, Bust:37.8inch, Length:32.3inch, Sleeve Length:17.7inch. S--Shoulder:15.0inch, Bust:39.4inch, Length:32.7inch, Sleeve Length:18.1inch. M--Shoulder:15.4inch, Bust:40.9inch, Length:33.1inch, Sleeve Length:18.5inch. L--Shoulder:15.7inch, Bust:42.5inch, Length:33.5inch, Sleeve Length:18.9inch. Above knee high, loose fit, tribal clothing/boho dress/bohemian dress/ethnic style clothing/summer beach dress. Tribal Print, V neck, Tie front, 3/4 sleeve, vintage printed, shift shape. Material: 100% Rayon. Fabric: lightweight, thin, no stretch. Boho Chic! 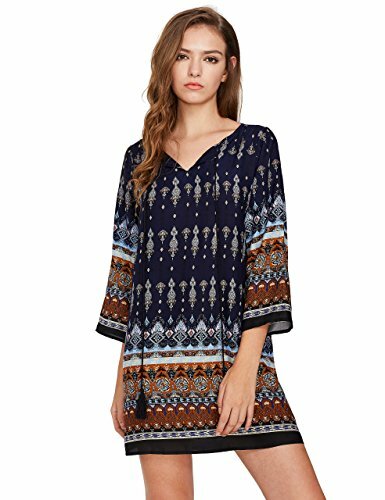 Bohemian Style, Clothing & Dresses, Boho Style, Tribal Printed style.